Whaley Bridge Juniors secure a new sponsor! 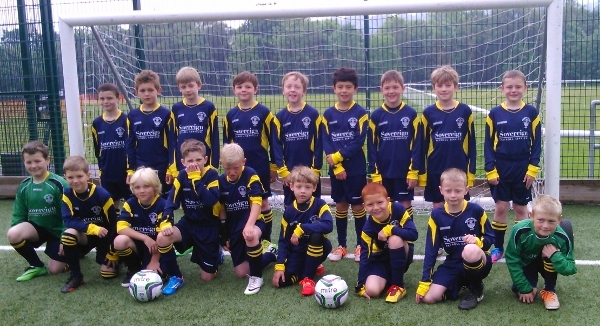 Whaley Bridge’s current under 9’s junior football team has secured a new team sponsor through the generosity of local business, Sovereign Payroll Services. The new football kits, which include a complete new strip, hoodies and rain jackets were presented to the team by Gavin Pickering, Managing Director of Sovereign Payroll Services at a specially arranged presentation held at Whaley Bridge’s Floodlit 3G Artificial Grass Pitch. The junior’s formed just a few years ago and progressed from occasionally played friendly matches with local sides to now representing Whaley Bridge AFC in the Stockport Metro Junior Football League. The coaching staff is made up of individuals who love the game and are prepared to invest their free time to train and coach the boys. With the parents contributing to the cost of the practice facilities and other associated league expenditure, investing in new kits as the kids grow is impossible without the support of businesses such as Sovereign Payroll Services. And the good news doesn’t stop there. The team have been badly in need of new football equipment. Through the financial support of local businesses Kelsa Truck Products and Simbal Limited, both based in Chapel-en-le-Frith and further donations received from local Whaley Bridge businesses; Rowcliffes Estate Agents, Leathems Solicitors and the Bike Factory and Redfern Farm Shop from Buxton; they have been able to invest in essential equipment for training and match days. The juniors are now well equiped for the forthcoming season. A special kit launch day was held on Saturday 7th June where the kits were presented to the team followed by a 2 hour training sessions and world cup competition. The mothers of the team members were on hand to provide much needed food and refreshments. All associated with the juniors would like to thank the extremely generous and kind support shown by the sponsor, Sovereign Payroll Services, our local business community and Whaley Bridge Town Council for the use of the 3G pitch for the presentation. Pictured at the presentation event is Gavin Pickering, Managing Director of Sovereign Payroll Services, and the coaching staff and the U9’s junior football squad.